Stephen Blaser was born in Logan and graduated from Logan High School before attending Utah State University. During his years at the university, he was very active in a number of campus honor associations. He also served as the financial vice president for the student body and the president of the junior class. Mr. Blaser graduated from USU in 1968 with a bachelor’s degree in accounting, earned his CPA in 1969 and, in 1970, completed the requirements for an MBA. After leaving Logan, he served as an Army finance officer and worked as an auditor for PricewaterhouseCoopers and in Arthur Andersen’s Tax department. However, over the years, fond memories of helping his father, a former director of Utah State’s Alumni Association, build homes during summers eventually led Mr. Blaser to pursue a different path in life–building the ranks of homeowners. With that objective in mind, he founded Care Free Homes in 1972. For over three decades Care Free’s mission has been to make home ownership affordable. To further that goal Mr. Blaser’s holding company recently purchased a retail region including operations in eight western states from the factory–built homemaker, Champion Enterprises. 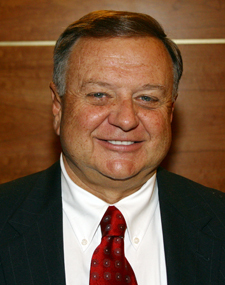 Throughout his lengthy career, Mr. Blaser has furthered his company’s core mission by founding organizations such as Blaser Financial, Blaser Holding, and Blaser Real Estate. He has also been very active in community affairs. He currently serves on the board of directors for Engage Now and Ascend. Mr. Blaser and his wife, Earlene, live in Bountiful, Utah. They are the parents of 8 children and 12 grandchildren.